Yep! Your standard, VERY basic and boring (and very SMALL!) bathroom. 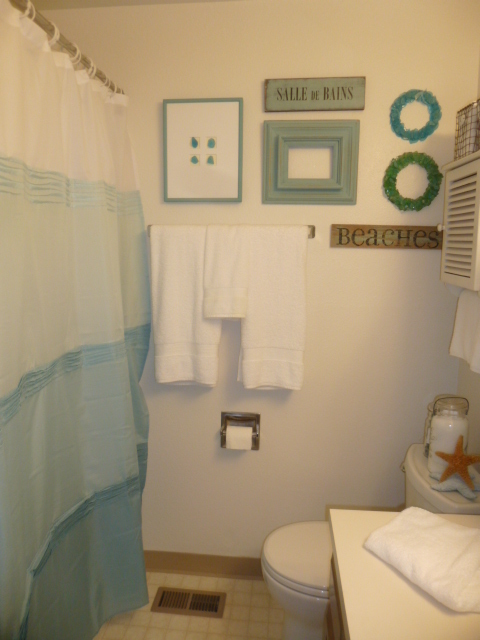 The bathroom is one of my favorite rooms to decorate so I’m kinda bummed at how small the one in my new place is. There isn’t even enough room on the floor to put my bathroom scale?!?! I have to lean it up against the vanity beside the toilet. And then re-set it from kilograms to pounds every time I use it! oy! I had accumulated a lot of stuff to decorate the bathroom with over the last year while I was planning the move. I had anticipated that I’d end up with 2 bathrooms, since I wanted 2 bedrooms and most 2 bedroom apartments have 2 bathrooms. So I accumulated enough stuff to decorate 2 bathrooms. Somehow I ended up with FOUR shower curtains?!?!? Because I was packing stuff away as I got it, I totally forgot how many I had bought!! And you won’t believe this, but the tub/shower in this place actually had GLASS DOORS, and didn’t even NEED a shower curtain?!?!? sheesh!!! But the doors had been removed when I looked at the place the first time, so I requested that they be left off. (which they were happy to do) I HATE cleaning those glass shower doors! Plus I’d much rather look at a pretty shower curtain; and the doors make the room feel even SMALLER. ( And I had already purchased a ‘tension’ shower curtain rod; intending to use separate rods for the liner and curtain.) So I did get to use at least ONE of my new shower curtains! I always buy the cheapo shower curtain liners from the dollar store, and when they start to get grimey, I just toss it out and buy a new one! **** MY SECRET METHOD FOR EASY SHOWER CURTAIN LINER REMOVAL: Since my plan to use the separate tension rod for the outer liner got the kibosh due to circumstances, and I HATE ‘wrestling with the curtain when I want to change out the liner; I bought TWO sets of shower curtain hooks. I use one set for the outer fabric curtain and one for the liner. Put ALL the hooks on your shower curtain rod. Use every other one for the outer curtain and then the others for the liner. This way, when it’s time to replace the liner (OR change out the curtain!) you only have to deal with the one piece that you are changing; and not battle with leaving one off while getting the other one off! 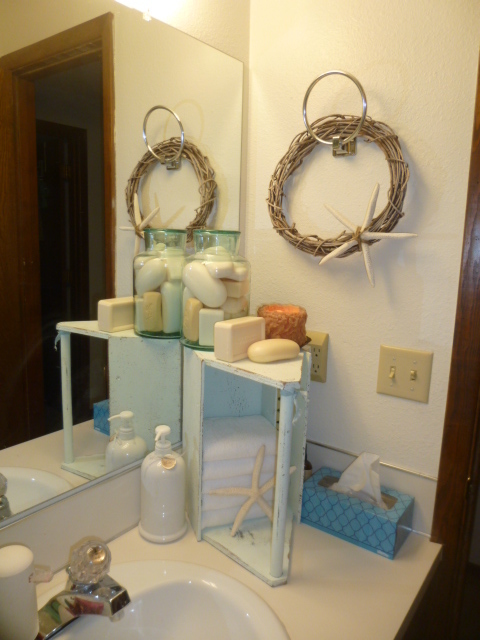 There is NO medicine cabinet and very little storage in the bathroom, so my decorations HAD to be functional! At least the sink vanity has extra room on the top to put stuff, but I didn’t want it to look all ‘cluttered with bathroom junk’. The two small drawers on the vanity are just big enough to hold hair brushes and hair clips etc. The big door in the center is where I store cleaning supplies, because you don’t want to put anything else under there where it smells all musty! 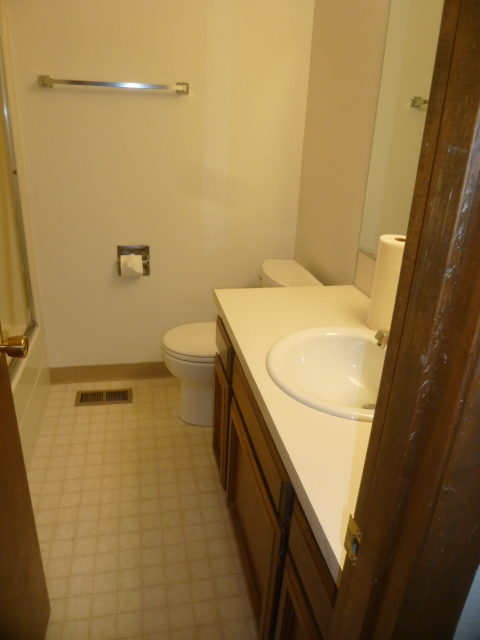 Small door on the left for toilet paper storage of course. And the other small door on the right for powder, face cleaner etc. 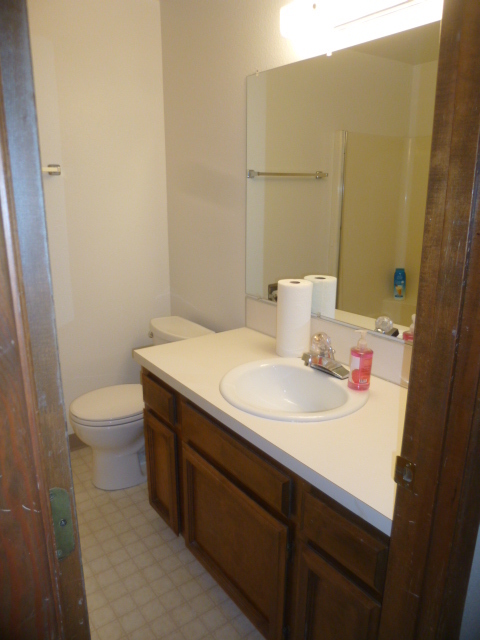 So, exactly how much decorating can you do in such a small bathroom? 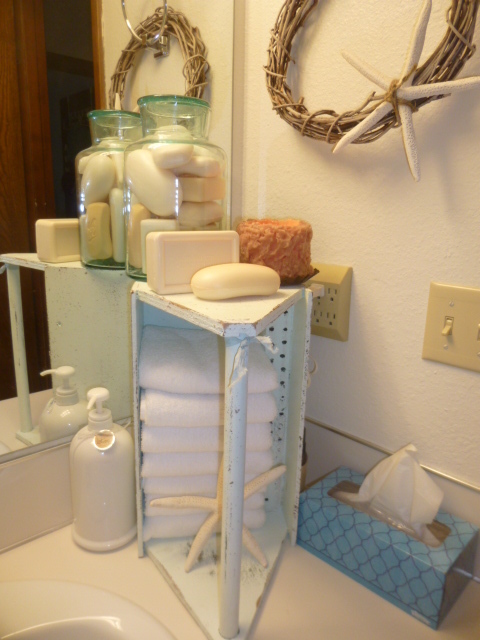 I had used this upcycled little aqua cubby shelf in the kitchen at the old place. 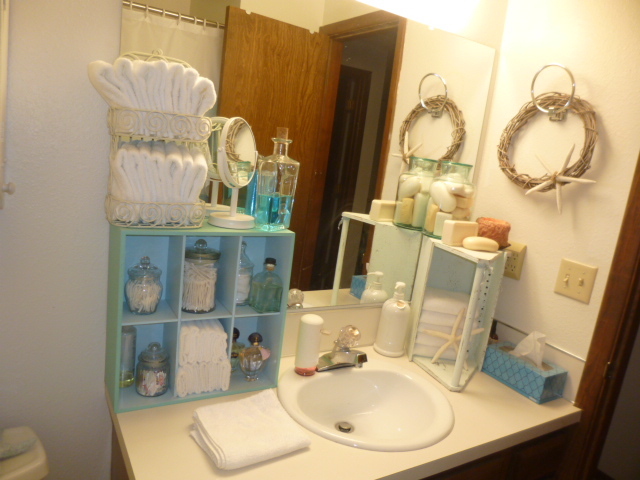 It fits perfectly at the left of the sink and holds some necessities in pretty bottles. 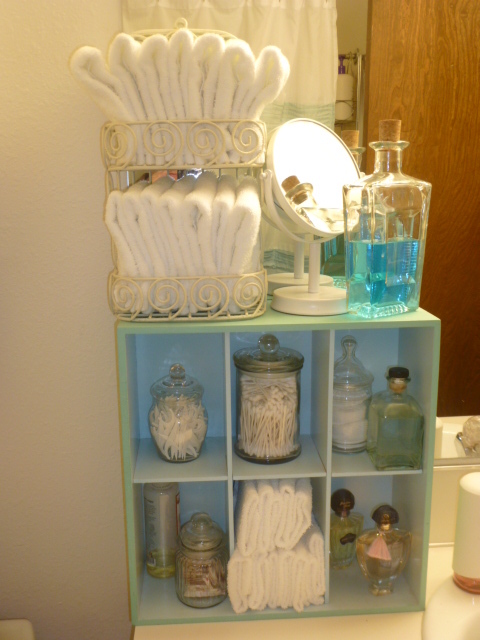 I opted for ‘mis-matched’ jars for my floss picks, q-tips and cotton pads. The little glass bottle next to the cotton pads is witch hazel, which is what I use the cotton pads for, to clean my face. In the lower cubbies is a jar of band-aids and some vanilla body spray; FACE cloths (which are NOT the same as WASH cloths!) and my Shalimar. There is even room on top of the cubby shelf for extra wash cloths, a magnifying stand mirror (which I need to SEE to put my mascara on!) and mouth wash in a pretty vintage bottle. It all looks so much prettier in clear bottles and jars, doesn’t it?!? 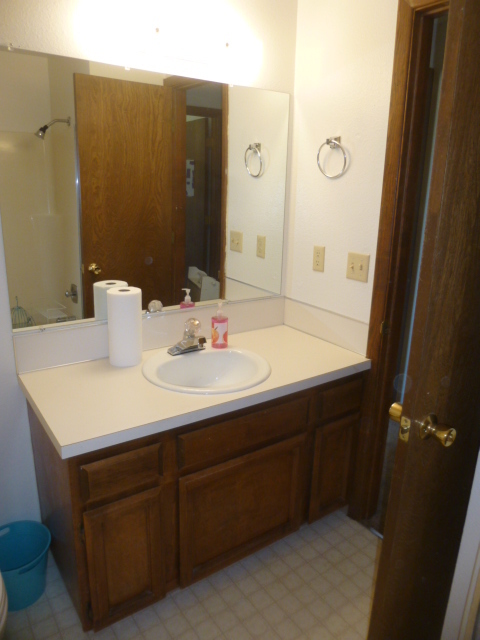 This is the area to the right of the sink. A vintage shabby trug is set on its end to hold hand towels and my big jar of soap on top. As I was perusing Pinterest and looking at bathroom ideas in the recent past, I kept seeing big jars filled with soap and LOVED the look. 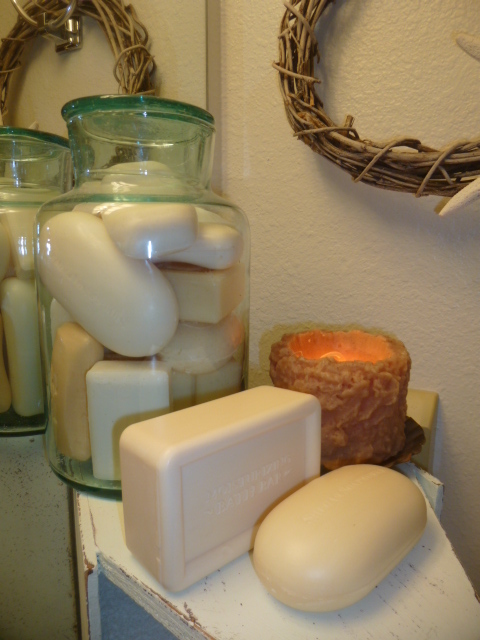 Leaving a couple of bars of soap outside the jar makes the bathroom smell wonderful! The candle is an electric one to leave on at night. 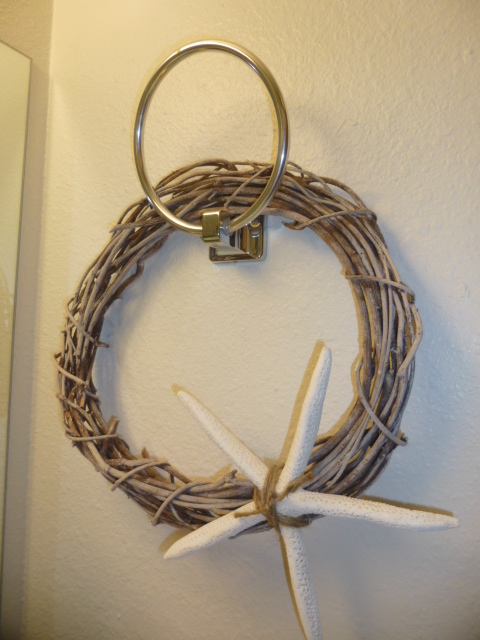 This starfish wreath to the left of the sing is hanging from the hand towel ring. It’s just too awkward of a place to hang the hand towel and the bare ring just hanging there bothers me! As for the hand towel, I just leave it folded on the vanity. 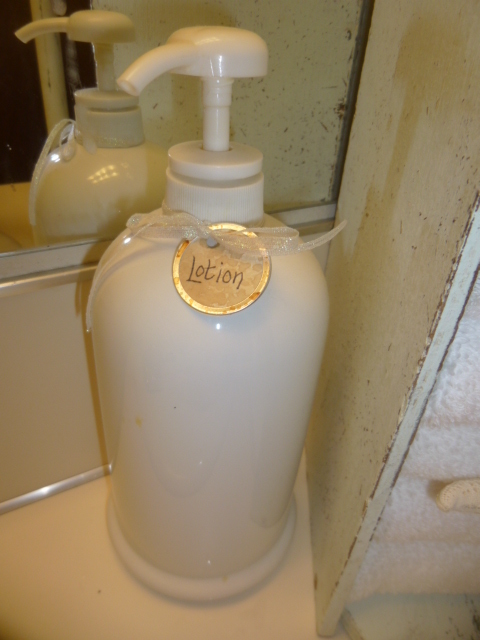 Big ceramic pump bottle of lotion; so much prettier than the plastic bottles the lotion comes in! I hung this little shutter cabinet over the toilet to store the stuff that’s not pretty; toothpaste, toothbrushes, face cream etc. The little rusty wire baskets on top hold the rest of my wash cloths. I bought the 24 pack of white wash cloths from Costco, so I had a LOT of them to store! (don’t forget to spray your rusty baskets with CLEAR spray paint first so the rust doesn’t shed!) This little shutter cupboard came from the old place too. Michael didn’t want to keep it. Sure glad I decided to hang on to it. I spray painted it white. 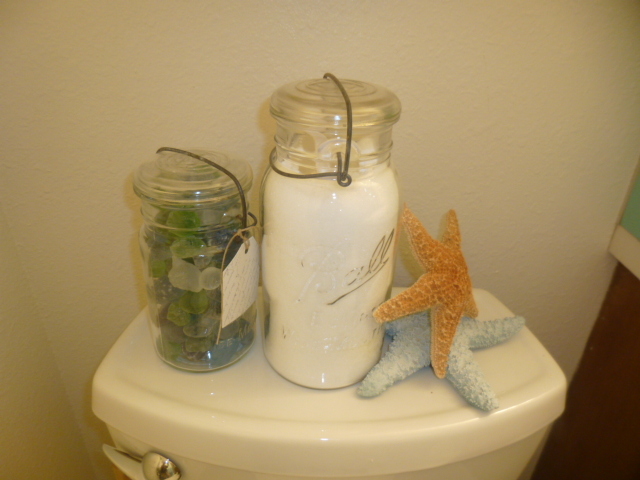 A vintage Ball canning jar filled with Epsom salt and another filled with beach glass and two starfish on the back of the toilet. Of course I HAD to hang some pretties on the wall! I went with all white for the towels and wash cloths. 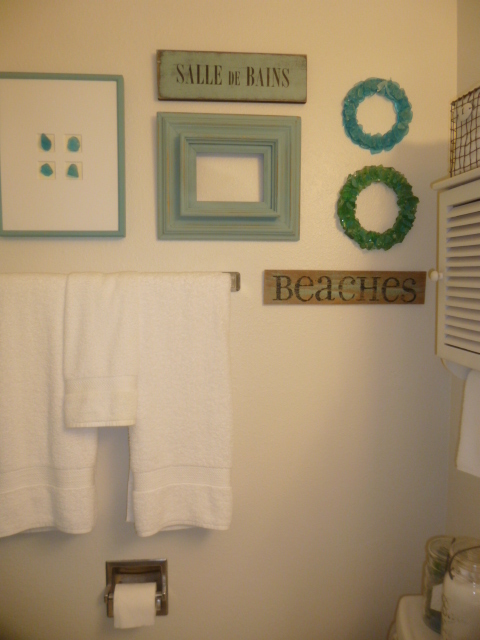 That way I can easily change up the bathroom decor whenever I want because the white towels will go with anything! And a glimpse of the shower curtain. I also have a solid white ruffled one, an aqua ruffled one, and a white chenille one! Maybe I’ll just change them out every so often. I’d use them as curtains if I had windows that they’d fit! This is about as good of a picture as I can get of MOST of the bathroom; with the shower curtain in the mirror reflection. Almost forgot! The difference between FACE cloths and WASH cloths??? I like the cheapo terry cloth wash cloths to use on my face. And the big fluffy wash cloths for body washing. Kind of silly, I know. Originally I started using the cheaper ones for washing my face and removing make-up because I didn’t want to get make-up stains on my ‘good’ white ones; and I can just bleach the cheap ones. But the big ones are just TOO big for just washing my face, and I like the way the terry cloth ‘scrubs’ my face. And that’s my NOT too BBB. OMG! 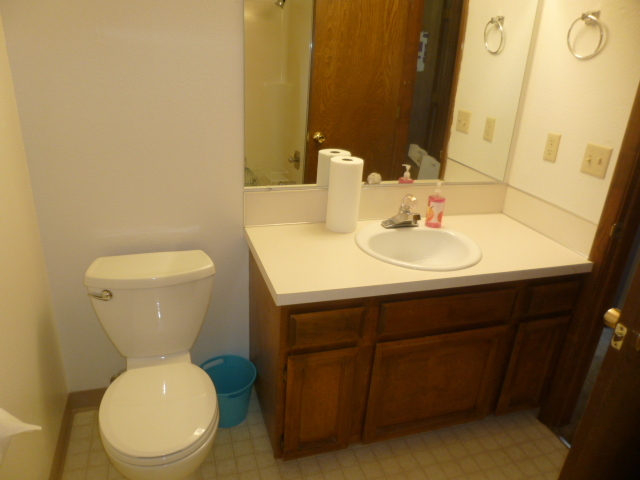 That little bathroom is exactly the same as the one I am having to use in the house I am staying in the US on my holiday!. I LOVE what you have done to yours! Makes it look lovely and far more friendly to use. I wish the person who owns this house where I am would allow me to feminine it up a bit. Ahhhh, he’s a man, what can I say? 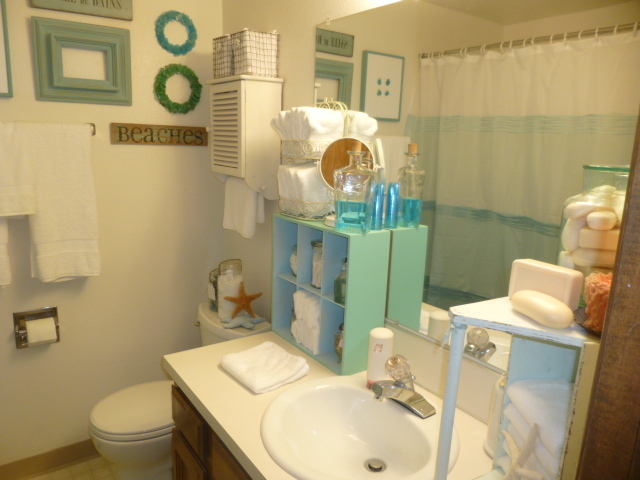 LOVE your bathroom makeover, terrific! Incredible difference! And I totally agree with your use of ‘face’ and ‘wash’ cloths. That looks so good! Really like how you decorated the little bathroom. 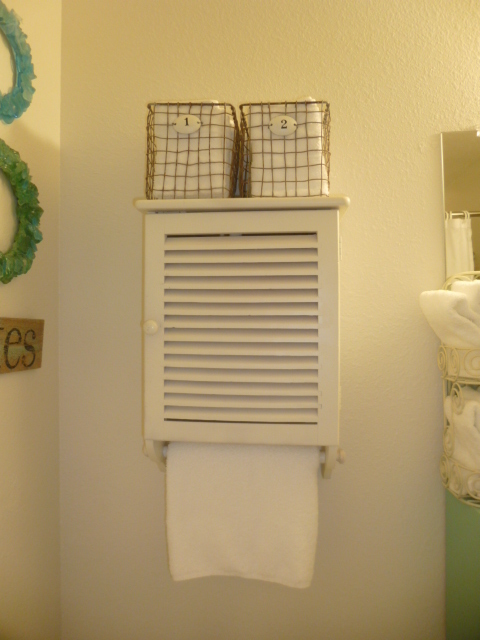 Can you remove the hand towel holder altogether and replace it with a cute hook? Might be more versatile at least. I think I got my ‘cheapo’ terry washcloths at Target, but I’ve also seen them at Kmart, WalMart, Winco grocery store . . .